This article first appeared in Life and Death in China (a multi-volume anthology of fifty-plus witness accounts of Chinese government persecution and thirty-plus essays by experts in human rights in China). When I wrote it [on the evening of June 3, 2013], Xu Zhiyong was under house arrest; when it was published [on August 27, in a translation by ChinaChange.org], he had already moved to the Beijing Third Detention Center. I dedicate this little essay to Xu Zhiyong and all those reactionaries whose homes have become prisons or who have made prisons their homes. Teng Biao (right) and Xu Zhiyong (now in jail) wear T-shirts that say “Free the blind man, Chen Guangcheng” in 2006. Meanwhile, though, this outcome is natural and inevitable. The back story for the award went like this: Following the Sun Zhigang Incident (孙志刚事件) in 2003, Xu Zhiyong, Yu Jiang, and I, known as the “three Ph.D.s,” made a public appeal to revoke the custody and deportation policy and, more than that, to conduct a constitutional review of the policy. It was a carefully-considered “open conspiracy” on our part, and we were prepared for the potential risk in making such calls. To our wildest surprise, instead of being punished, we were commended by the government. Honestly, I’m a little embarrassed now that there was once a time when I was not ashamed of being praised by this government. With a Ph.D. from Peking University; a bar certificate; a headful of ideas about freedom, democracy, and constitutionalism that are deemed “reactionary” by the party doctrines; a pen that can argue and incite; and an inflated sense of self due to hype from domestic and overseas media outlets, I became active and quickly known in China’s human rights movement, thanks to the bountiful injustices found everywhere in the country. I was involved in legal aid; I represented clients in human rights cases; I founded two reactionary NGOs Gongmeng (公盟) (with two other people) and China Against Death Penalty (北京兴善研究所); I accepted interviews by reactionary media outlets; I indulged in the reactionary “foreign Weibo” (better known as Twitter), I wrote reactionary articles and received reactionary payments for them; I either initiated, or participated in, reactionary citizen signature campaigns; I took part in street demonstrations and mass look-on protests (围观); I gate-crashed black jails and brainwashing classes sponsored covertly by local governments; I promoted the New Citizens’ Movement and hopped everywhere for dinner gatherings. Step by step, I abandoned the party and its universal truth and walked onto an anti-revolutionary path. 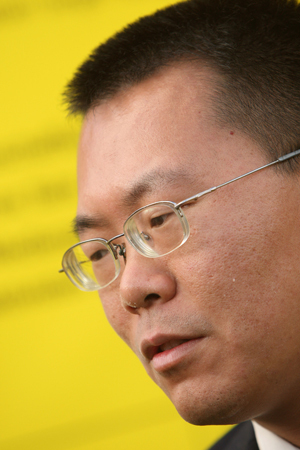 Chinese human rights lawyer Teng Biao speaks to reporters at an Amnesty International-sponsored event in Berlin to protest for improved human rights in China, December 7, 2007. In one incident after another, I have never chosen the right stand. This cannot be explained away by rashness or accidental missteps; instead, it is clear that this is a person who has completely lost his class stand, who hates the socialist slavery with Chinese characteristics, who has been completely brainwashed by the capitalist hypocritical notions of political democracy and human rights, and who has no gratitude toward the party-state’s generosity of educating him and not having murdered him. In short, he turns against the cook after being fed full. To be perfectly honest, I have done all these to make my life a little better, starting from the Sun Zhigang case, to all my expressions and actions thereafter. As for terms such as “reactivating the constitution,” “defending rights through legal means,” “non-violence,” and “the New Citizens’ Movement,” all of them were mere disguises. In time, I learned that there were a few blockheads in this world who felt awful when they saw others being bullied; when they felt awful, they were unwilling to keep it to themselves. So they shouted it out and wrote it up. Since they had no lethal weapons, they summoned the spiritual weapons in their hearts, legal tools in their heads, and took advantages of media outlets and the Internet that “had no clue about the truth.” They hurled themselves forward, huffing and shouting, determined to fight to the end without fear of getting their heads cracked or shedding their blood, whether the other parties were corrupt officials, ruthless power players, or naked officials (officials who have sent their family overseas); thugs, legal illiterates or illiterates; principals, bureau chiefs, or provincial heads; the tall-big-and-perfect, the great-glorious-and-total, or the universal truth. Among this small group of people were lawyers, scholars, journalists, artists, petitioners, farmers, netizens, and humble and anonymous members of society. They didn’t make a lot of money but they risked a lot; they derived pleasure from their hardship. They were vastly outnumbered, but every now and then they scored accidental victories here and there. Sometimes they lost the battle but gained in morale, emerging victorious from defeat. As a result, more discontented or naïve people joined the ranks of the Five Black Types and became bad elements. For a while, this contingency force was pretty geared up. Government petitioning, online mobilizing, street demonstrating, court challenging, they battled and lost and battled more and lost more. Short of an insurgency, they had done it all. Now, this was getting out of hand and had to be dealt with. First, they came to me speaking softly: “Look, you have knowledge, fame, and opportunities. Why mix with those people? You will enjoy many benefits if you side with the party.” I didn’t listen. I continued. Then came the warnings: “It’s very dangerous if you continue. Take our advice, you’ll have a full belly. There will be consequences for giving trouble to the government. Don’t you see? Professional promotions, research funding, awards, you get none.” I didn’t listen. I kept going. Then they began to dress me down. They confiscated my passport, so that I wouldn’t have a chance to experience the sufferings of life overseas. I didn’t listen. I kept going. Then they disbarred me. The Chairman of the Beijing Lawyers’ Association Li Dajin and the chiefs at Beijing Bureau of Justice hissed: “We must find ways to smash the rice bowls of these lawyers.” I didn’t listen. I kept going. Then they closed down my blogs, my Weibo accounts, and my reincarnated Weibo accounts. I was barred from media interviews and college lectures. Upon swiping my ID, the screen would display “key stability maintenance target.” Some of the people who knew me wouldn’t dare to dine with me or even call me anymore. I didn’t care. I kept going. Then they used thugs to follow me and attack me when I was away from home working on cases. Around the country’s sensitive dates, regular or circumstantial, I would be placed under house arrest by the domestic security police, or taken to travel in their company as they attempted patiently to give me their political persuasions. I was obstinate, sinking only further and deeper. Then, to save me, they used kidnapping. In the middle of the night, they covered me in a black hood, handcuffed me, and threw me in a little black car, took me to a black jail, and locked me in a little black room for two days and two nights. They threatened to throw me in jail for inciting subversion of state power. I didn’t repent. Instead, I wrote articles, acted as a citizen deputy in case after case and organized NGOs to assault the socialist rule of law with Chinese characteristics. If I stopped at any given point, repented, reinvented myself, I could still have had a great future. They had known all along, it turned out, the thing that I feared under the surface of bravery. They knew it from the very beginning, which I should have known. I feared for the people I love. Once my wife and daughter were hurt and faced with more threats, I was immediately caught in a dilemma. “Are you a responsible man or not?” In an irresponsible system, for a person wanting to be responsible, family responsibilities and social (historic) responsibilities are in direct conflict with one another. If you end up in prison, you will not be able to take care of your family; but to walk this path that I do, you will inevitably end up in jail or alternatives of jail. Away from this path, you may fulfill your family obligations, but you not only have to abandon your ideals, your children will continue to live in the same irresponsible system, and they too in the future will face the choice between family obligations and social responsibilities. Not to mention that it’s irresponsible to leave what we ought to be doing to the next generation. All right, I would continue doing things, but not get myself in jail. Learn to restrain, to retreat, to use tactics, and to hitchhike. But the problem is, that you-know-who organization observes no clear rules and follows no particular patterns when it comes to arresting people. If there are predictable rules, we would have been more or less living in a regular society. But no, the totalitarian rulers are very much like a spoiled kid. Tactics you consider safe are not necessarily safe. Shi Tao (师涛) was handed a ten-year sentence for an email, Yang Chunlin (杨春林) a six-year sentence for a slogan, and Wang Yi (王译) one-year reeducation-through-labor for a five-character tweet. On the other hand, there were people who had made waves non-stop without being thrown in jail. For example, before 2008, Dr. Liu Xiaobo (刘晓波) had written knife-sharp articles worth several million words and done many bad and provocative things, but he was fine. But being spared today doesn’t mean you will be spared tomorrow, and in the end, he did himself in. Will famous people be spared prison? Well, Gao Zhisheng (高智晟), Hu Jia (胡佳), and Ai Weiwei (艾未未) were all pretty famous when they were snatched away. Will you be safe if you don’t organize political parties, don’t touch cases involving Falun Gong, Tibetans, and Uighurs? Most of the political prisoners had nothing to do with these taboos. Oh, the handicapped and the elder will be spared. No, not so, just look at Chen Guangcheng (陈光诚), Luo Yongzhong (罗永忠), Yan Zhengxue (严正学), Zhu Chengzhi (朱承志). Examples abound, and at least two people in their eighties were sent to reeducation-through-labor camps, and countless more elders were locked up in black jails. The system needs such fogginess to emanate its menacing power. All right, how about stepping back? Well, in terms of society as a whole, to trade freedom for safety one will likely get neither in the end. But individuals do become safer when they don’t cause trouble for the government. The question then is: To where can you step back? When you feel it’s not safe enough to step one step back, you will need to step two steps back; still feeling unsafe, you step further back—all the way back to the point of pretending you are deaf and blind. You feel safe then. But if everyone is stepping back, the criteria by which they arrest people will change accordingly: Even if everyone protests in muffled voices, they will still find the loudest. If they couldn’t find it, they would fabricate one. Do you think the government will stop arresting people and the CCP-brand meat grinder will cease to work if we all become mild, reasonable, neutral, and objective, obsessing over strategies of how not to exasperate the authorities? If no one criticizes openly, they will arrest those who criticize privately. Arresting people is a must, and the criteria depend on the overall level of the potential offenders. The extent of political tolerance, on the other hand, is expanded by the acts of those who have been imprisoned. This is precisely the twist and the trap of this system, and it also seems to be the destiny of democracy fighters and human rights defenders in China: one loses freedom for loving freedom; one fights for freedom by losing it. Those who realize this have no place to retreat. Okay, for the sake of safety, let’s sing the praises of the party. But here a problem arises too: Praise singers are not always safe either; after all, there is only one Shen Jilan (申纪兰), the only bipedalism who has sung the right songs over decades, and that’s kind of hard to emulate. To be like her, one surely will wake up from the Chinese dream with a fright! Others are selling themselves cheap; if your price is higher, no one will buy you. Of course if you mean to take part in the Chinese intellectuals’ contest for lowliness, well, that will be another story. Liberty will not fall from the sky. One inch of blood is for one inch of liberty. Li Wangyang (李旺阳), Li Hong (力虹), Sun Zhigang (孙志刚), Xue Jinbo (薛锦波), Qian Yunhui (钱云会), Tang Fuzhen (唐福珍), Tapey (扎白)… bad elements are like chives, cutting down one batch, another batch grows. Last year, I visited dissident writer Mu Chuanheng (牟传珩) in Qingdao. He was imprisoned for his writings. But in prison he continued to write reactionary articles and managed to send them out to reactionary magazines overseas. What are they going to do with a man like him? Sentence him again? To stop him from writing, the only way is to destroy his physical being. But if they destroy his physical being, they would have helped him make his body his last work against totalitarianism. Most of the political prisoners, were not repentant when released. They continued their criminal actions for which they were repeatedly jailed This is probably beyond the comprehension of the invincible communist vanguards. Open murdering can be problematic; perhaps assassinations are called for. In the end, the spiritual resistance against totalitarianism will inevitably become physical resistance against it. We are calculating, at any given moment, the ratio of the spirit and the flesh in our lives. I am scared of death but am courting it; I’m indomitable but fainthearted at the same time. Every moment of my life is brimming with happiness, but just as much of it is imbued with pain. Such are the confessions of a reactionary.